After the Royal Proclamation was issued a peace council was held at Niagara in July of 1764. Some 1,500 First Nations chiefs and warriors met with Sir William Johnson, British Superintendent of Indian Affairs, who represented British interests. Conspicuously absent was Pontiac and the Ottawa of Detroit. The Potawatomi, Wyandotte and Chippewa of Saginaw also refused to attend. Johnson presented the First Nations with two wampum belts. The first beaded belt contained two figures holding hands as well as the year of the council. Johnson proclaimed on this belt, “My children, I clothe your land, you see that Wampum before me, the body of my words, in this spirit of my words shall remain, it shall never be removed, this will be your Mat the eastern Corner of which I myself will occupy, the Indians being my adopted children their life shall never sink in poverty.” Johnson was coveting with the First Nations that the British recognized their ownership of the land and that they would respect that by only occupying the eastern corner of it leaving the rest for the First Nations to live in and prosper as allies. The second belt was called the Twenty-four Nation Wampum. It was a beaded belt that had twenty-four figures on it holding hands and pulling a large sailing ship. The English words that accompanied this belt were, “My children, see, this is my Canoe floating on the other side of the Great Waters, it shall never be exhausted but always full of the necessities of life for you my Children as long as the world shall last. Should it happen anytime after this that you find the strength of your life reduced, your Indian tribes must take hold of the Vessel and pull towards you this my Canoe, and where you have brought it over on this land on which you stand, I will open my hand as it were, and you will find yourselves supplied with plenty”. The Royal Proclamation was impossible to enforce. Squatters from the colonies immediately ignored it and began to cross the Alleghenies. Both land speculators and squatters regarded the rich lands west of the Alleghenies as a prize to be had for the hard-fought victory of the French and Indian War. Land speculators like George Washington, Thomas Jefferson and Patrick Henry resented the Monarchy using the Proclamation to stifle their efforts to make a profit from “Indian lands”. Washington said he thought it was only a temporary measure to settle the First Nations and would soon fall. So he advised his business associate William Crawford to scout out lands in First Nations’ territories before others did. Speculators flooded the colonial government with petitions for land grants even though it was illegal. In 1767 Indian Agent George Croghan made a trip from New York to Detroit and back to assess the state of Indian Affairs in “Indian Country”. He spent two days with some chiefs and warriors of the Delaware Nation trying to ascertain the purpose of a large council of Western Nations he had heard was to be held the following spring. On the second day the chiefs told him they did not know the purpose of the council but the First Nations were generally dissatisfied with the conduct of the British. They complained that the British hounded them for every minor crime committed by them, but they ignored even the most aggrieved crimes including murder that British subjects committed against the First Nations. In short they could get no justice. In 1768 Sir William Johnson held a council with the Six Nation Iroquois at Fort Stanwix. They agreed to cede a huge tract of land south of the Mohawk and Ohio rivers and east to the Tennessee River which was the hunting grounds of the Shawnee Nation. It covered what is now western Pennsylvania as well as most of Kentucky and West Virgina.. The Iroquois claimed ownership based on conquests made in the seventeenth century but they had long since lost the territory. But none of that mattered to the Colonial Government. This gave them reason enough to openly ignore the Royal Proclamation and approve petitions for land across the Alleghenies. The land rush was on. Johnson was given a dressing down for overstepping the bounds of his government position but the damage was already done. The Shawnee fought back against the trespassers by killing them and/or burning them out. The nasty skirmishes continued on for the next five years. It escalated when in the spring of 1774 colonial vigilantes murdered the family of the Mingo chief Tachnedorus. The family included the chief’s pregnant sister who was strung up by her wrists, sliced open and the unborn child impaled on a stake. Tachnedorus’ grief was unbearable. He exacted his revenge by attacking and killing settlers in Virgina. This gave the Colonial Government a reason to declare open warfare on the Shawnee. This “war” was called Lord Dunmore’s War after the Governor of Virgina. The Shawnee sent out war belts to the other nations near them. But the British used a divide and conquer strategy. Johnson worked on the Iroquois and John Stuart, Superintendent of Indian Affairs in the South, the Cherokee. Consequently the belts were rejected and the Shawnee were left to fight the war alone. Dunmore led an army of 1,500 volunteer militia down the Ohio River from Fort Pitt. General Andrew Lewis at the head of 1,100 men moved down the Kanawha River to meet Dunmore on the Ohio. The plan was to attack and destroy Shawnee towns on the Scioto River. The Shawnee rallied their warriors but could only raise 700 men. They were hopelessly outnumbered. Their war chiefs Cornstock, Black Hoof, Black Fish, Blue Jacket and Packeshinwaw held a council. They determined the only chance for success was to meet the enemy head on in a surprise attack. They crossed the Ohio on rafts in the night of October 9th and surprised Lewis at a place called Pleasant Point. The battle raged on all day with first the Shawnee pushing the Virginians back. Then reinforcements arrived and the Shawnee were forced to retreat and take up a position on the banks of the Ohio. Finally, with the battle lost they were forced to withdraw back to their towns on the Scioto. The only solution was to sue for peace. Cornstock spoke for the Shawnee. He chose to deal with Lord Dunmore at Camp Charlotte. The peace was costly. The Shawnee had to give up all claim to the lands south of the Ohio and had to send four hostages to Williamsburg to be held in order to ensure future peaceful conduct. One of the hostages was Cornstock’s own son Wissecapoway. Lord Dunmore’s War brought a measure of peace but more storm clouds appeared on the future as the Colonies continued to rail against Great Britain. When we last left the siege at Detroit feelings on both sides had escalated to a fever pitch. The warriors had just captured supplies sent to the fort from Niagara and were celebrating by consuming all the liquor. A nephew of Wasson, the leading war chief from Saginaw, had been killed and his body desecrated. In retaliation the Saginaw Chippewa killed and desecrated a prisoner of theirs, Major Campbell, who also happened to be the cousin of Major Gladwin. Gladwin was in a high state of agitation over the affair so he agreed to let Captain Delyel lead a sortie of 277 men designed to surprise Pontiac’s main camp which was about three and one-half miles up river. They assumed his warriors would be either passed out or in a state of inebriation from the rum they had been celebrating with. Delyel had very recently arrived at the fort with a company of American Royals and was eager to give the warriors a taste of British discipline. On July 31st at a quarter to three in the morning he led 247 men out of the fort and marched them up the river road toward Pontiac’s camp. He was accompanied by two gunboats containing thirty men that followed them along the shoreline. Little did they know Pontiac had a French spy inside the fort who had advised him of the British plan. All the warriors were sober and had taken up position at a place that would become know as Bloody Run. Parent’s Creek ran into the Detroit River about a mile and one half up river from the fort. There was a long wooden bridge over the creek at its mouth. The Ottawa and Chippewa warriors had spread themselves out along the road on both sides of the bridge hiding themselves in the orchards, the long grass, reeds and behind fences and rows of cord wood that had been stacked by the French homesteaders who lived there. The British arrived at the bridge just as day was breaking. Captain Dalyel lead the company onto the bridge but before they reached the other side the warriors opened fire. This put the British in disarray but they soon regained composure and realized they had no choice but to retreat back to the fort. They were outnumbered two or three to one. As they began their retreat Captain Delyel came face to face with Geeyette, Pontiac’s brother-in-law. Delyel had a pistol and Geeyette motioned him to put it down. Delyel refused and the Ottawa warrior shot him dead. The rest, with support from the two gunships, fought their way off the bridge and took up positions in several houses to try to prevent the warriors from getting between them and the fort. They stayed entrenched in the houses for nearly an hour but then left to resume the retreat. The Potawatomi and Wyandotte rushed to the sound of the gunfire and joined the battle. The warriors who were in pursuit were hampered by fire from the gunboats and gave up the chase when they reached the range of cannon fire from the fort. The defeated company reach the safety of the fort carrying some of the dead and wounded. One wounded soldier was even carried back to the fort in a chair. Others were put into the gunboats during the battle. Only seven were left on the battlefield. After the battle the seven dead soldiers were loaded into canoes. Pontiac ordered the French settlers to return the “English dogs” to the British fort. The British lost officers Captain Delyel and Captain Gray along with lieutenants Luke and Brown. Among the enlisted men the 35th Regiment had one Sargeant, one drummer and thirteen rank and file killed plus twenty-five wounded. The 60th had one killed and seven wounded. The 80th had two killed and three wounded and the Royal Americans had two killed and one wounded. There was also a trader’s servant wounded. The total killed and wounded was sixty-one. The warriors had five killed and eleven wounded. The battle of Bloody Run was the height of the siege. The rest of the summer was spent in small skirmishes with the French settlers friendly to the British smuggling supplies into the fort under the cover of darkness. This made the objective of starving out the British impossible. When autumn arrived Pontiac’s coalition began to fall apart. Generally speaking First Nations were unable to hold a confederacy for war together for extended periods of time. The time for the fall hunt had arrived and most warriors were anxious to abandon the war effort and begin the hunt in order the feed their people in the coming year. Although the coalition disintegrated without realizing their impossible goal of “driving the English into the sea” the Beaver War did accomplish some great things. General Amherst was recalled to England and his Indian policy was replaced by one much more friendly, one modeled after their predecessors the French. As a footnote Major Gladwin was censured for not seizing Pontiac when he had the chance. The King issued the Royal Proclamation of 1763 which was the first official recognition by the Europeans that land in North America was owned by the First Nations. It laid out a boundary that ran basically along the Appalachian mountains which recognized lands west of the dividing line as “Indian Lands”. These lands came under the protection of the British Crown and could not be purchased directly by a British citizen from an “Indian”. British colonists were prevented from expanding onto the “Indian Lands”. The colonists accused the Crown of capitulation in the Beaver War and immediately ignored the proclamation’s prohibition of westward expansion. The hated proclamation helped fuel sentiments for independence a decade later. In Canada the Royal Proclamation of 1763 is still in effect and used in courts to settle modern-day land claims. 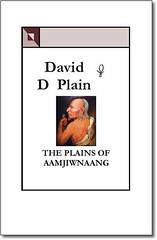 You are currently browsing the Books by David D Plain Blog blog archives for May, 2011.